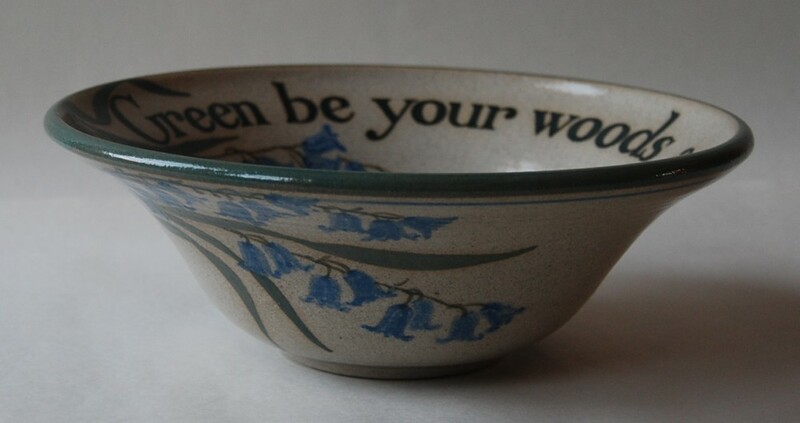 with the bluebells and their lovely strappy leaves spread out in a spray across the bowl’s expanse. This pot was thrown on the wheel with 2kg of stoneware clay, the foot turned, and then I decorated the text and foliage with a brush in underglaze oxides. Then the bowl was fired twice, first to fire the colour into the clay body, then to fire the clear glaze into the clay’s surface. I made it with a group of other meadow pots, some with flowering rosemary and thyme, some with primroses and cowslips. Signed one-off, 25cm across x 7cm high, for sale £70 now sold. Permission is needed for the use of any of these photos.